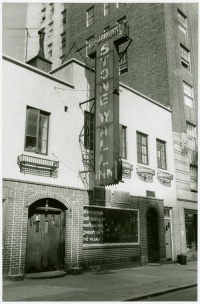 The Stonewall riots were a series of violent conflicts between New York City police officers and groups of gay and transgender people that began during the early morning of June 28, 1969, and lasted several days. Also called the Stonewall Rebellion or simply Stonewall, the clash was a watershed for the worldwide gay rights movement, as gay and transgender people had never before acted together in such large numbers to forcibly resist police. The Stonewall riots were a series of spontaneous, violent demonstrations against a police raid that took place in the early morning hours of June 28, 1969 at the Stonewall Inn, in the Greenwich Village neighborhood of New York City. They are frequently cited as the first instance in American history when people in the homosexual community fought back against a government-sponsored system that persecuted sexual minorities, and they have become the defining event that marked the start of the gay rights movement in the United States and around the world. American gays and lesbians in the 1950s and 1960s faced a legal system more anti-homosexual than those of some Warsaw Pact countries. Early homophile groups in the U.S. sought to prove that gay people could be assimilated into society, and they favored non-confrontational education for homosexuals and heterosexuals alike. The last years of the 1960s, however, were very contentious, as many social movements were active, including the African American Civil Rights Movement, the Counterculture of the 1960s, and antiwar demonstrations. These influences, along with the liberal environment of Greenwich Village, served as catalysts for the Stonewall riots. After the Stonewall riots, gays and lesbians in New York City faced gender, class, and generational obstacles to becoming a cohesive community. Within six months, two gay activist organizations were formed in New York, concentrating on confrontational tactics, and three newspapers were established to promote rights for gays and lesbians. Within a few years, gay rights organizations were founded across the U.S. and the world. On June 28, 1970, the first Gay Pride marches took place in Los Angeles and New York commemorating the anniversary of the riots. Similar marches were organized in other cities. Today, Gay Pride events are held annually throughout the world toward the end of June to mark the Stonewall riots. Unless indicated otherwise, the text in this article is either based on Wikipedia article "Stonewall riots" or another language Wikipedia page thereof used under the terms of the GNU Free Documentation License; or on original research by Jahsonic and friends. See Art and Popular Culture's copyright notice. This page was last modified 12:27, 28 June 2009.